Synthetic peptide conjugated to KLH derived from within residues 150 to the C-terminus of Human CD3. Recombinant Human CD3 epsilon protein (ab114153) can be used as a positive control in WB. 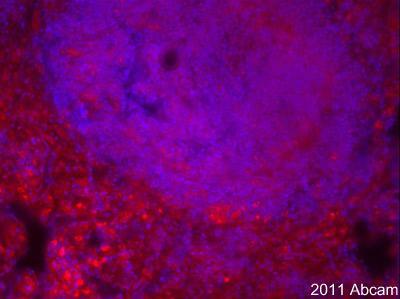 This antibody gave a positive signal in Jurkat whole cells and thymus tissue from Mouse and Rat. Our Abpromise guarantee covers the use of ab16044 in the following tested applications. WB Use a concentration of 0.5 µg/ml. Detects a band of approximately 23 kDa (predicted molecular weight: 23 kDa). Lanes 1 - 6: Merged signal (red and green). Green – ab16044 observed at 23 kDa. Red - loading control, ab8245, observed at 37 kDa. This blot was produced using a 4-12% Bis-tris gel under the MES buffer system. The gel was run at 200V for 50 minutes before being transferred onto a Nitrocellulose membrane at 30V for 70 minutes. The membrane was then blocked for an hour using Licor blocking buffer before being incubated with ab16044 and ab8245 (loading control) overnight at 4°C. 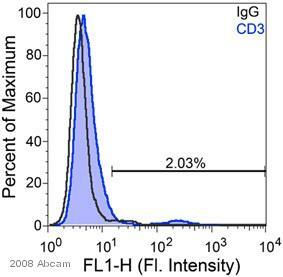 Antibody binding was detected using Goat anti-Rabbit IgG H&L (IRDye® 800CW) preabsorbed (ab216773) and Goat anti-Mouse IgG H&L (IRDye® 680RD) preabsorbed (ab216776) at a 1:10000 dilution for 1hr at room temperature and then imaged. Additional bands at: 18 kDa, 48 kDa, 62 kDa. We are unsure as to the identity of these extra bands. This blot was produced using a 4-12% Bis-tris gel under the MES buffer system. The gel was run at 200V for 35 minutes before being transferred onto a Nitrocellulose membrane at 30V for 70 minutes. The membrane was then blocked for an hour using 2% Bovine Serum Albumin before being incubated with ab16044 overnight at 4°C. Antibody binding was detected using an anti-rabbit IgG VHH single domain antibody conjugated to HRP, and visualised using ECL development solution ab133406. CD3 was immunoprecipitated using 0.5mg Jurkat whole cell extract, 5µg of Rabbit polyclonal to CD3 and 50µl of protein G magnetic beads (+). No antibody was added to the control (-). Proteins were eluted by addition of 40µl SDS loading buffer and incubated for 10min at 70oC; 10µl of each sample was separated on a SDS PAGE gel, transferred to a nitrocellulose membrane, blocked with 5% BSA and probed with ab16044. Publishing research using ab16044? Please let us know so that we can cite the reference in this datasheet. Sorrythere was a typo inmy intial inquiry. Can you give me suggestion on rabbit anti CD3 for IHC-p as you mentioned in the email? In order to help investigate the problems with ab5690 and see if there are any tips I can offer to help, would it be possible to find out a bit more information about your protocol? I have included some questions below. Looking forward to your reply. Forward/Side scatter were used to eliminate cellular debris. The accompanying marker was applied such that only 2% of the IgG control was positive.